Helping to maintain sustainable operations for the largest dairy in northeast Texas is the job of Volvo CE-equipped farm, Still Meadow Dairy. Best known for its oil barons and cowboy culture, Texas is experiencing a new kind of gold rush, with the Lone Star state now one of the leading dairy producers in the United States. With an annual rainfall of 910 mm (36 in) and a particularly long summer, Texas is at the heart of cattle culture – and ripe with opportunity. Farmers far and wide have flocked to the oak-dappled ranges of the giant southwestern state to raise their livestock. But this wasn’t always the case. Until the 1970s, Texas was next to nowhere in milk production – a stark difference to today’s ranking as six in the nation, after California, Wisconsin, Idaho, New York, and Pennsylvania. In order to climb the rungs of the production ladder, many farmers are forced to modernize their farms. Established more than half a century ago by Jack Kempenaar, Still Meadow Dairy quickly built a reputation in the U.S. as a farm produce specialist. An experienced agriculturalist in his native Holland, in 1986 Kempenaar transplanted his dairy operation – one of the leading dairies in the Netherlands – and three children to a 460-acre farm in Como, Texas – a tiny farm in Texas terms. Still Meadow’s cows live in open-air barns with water-cooled fans – necessary comforts that contribute to a better quality product. The large-scale operation churns out over 39 million liters (9 million gal) of milk each year and sells its product to Dean Foods, one of the largest milk processors in the country. The intelligent load-sensing hydraulic system helps the operator better control both the Volvo L90F wheel loader and the load. To maintain an economic operation, the large-scale farm is conducted on a small-scale balance sheet. Because dairy farmers are at the mercy of fluctuating milk prices, containing costs is a lifeboat to stay afloat during economic downturns. “In order to be profitable, you have to become more efficient,” Kempenaar says. Such is the reason Still Meadow decided that it needed suitably efficient machines to support its daily feed and waste loading tasks across the farm. The company has built up its equipment fleet so that it now includes seven machines from Volvo, each averaging around 1,000 hours each year. The equipment has been supplied by respected local dealer ROMCO Equipment and includes L70D, L70E, L90C, L90D, L90F, L110F and L150E wheel loaders. While some are older model machines, their mint condition defies the hours accumulated on all original engines and transmissions. 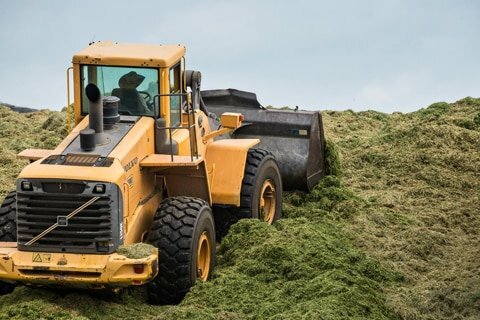 Their largest Volvo wheel loader – the L150E – is used to load, pack and level the silage (fermented grass feed) into bunkers. Given the variations in ground conditions of the work site, the 100% front axle differential locks provide added traction. “The fuel economy is very good and the loaders offer stability, which is a real benefit when working in the silage pit,” says Kempenaar. Joining the Volvo L150E is an L90C wheel loader – the farm’s first Volvo wheel loader, which was purchased in 1997. With over 43,000 hours, the L90C is the dairy’s most utilized loader, moving feed from the commodity bunkers. 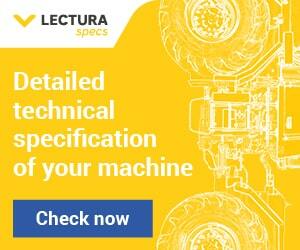 It is fitted with a high-tip rollout bucket with torque parallel linkage, providing high breakout force. Volvo’s TP-linkage, attachment bracket and genuine Volvo attachments make the flexible L90F wheel loader the perfect machine for all of Still Meadow’s applications. Ensuring the machines are working at their optimum levels is Kyle Watson, territory sales representative for ROMCO. When Kempenaar needed a swift and safe way to clear excess feed from barn alleys, Watson worked with Volvo-approved attachment vendor Dymax to design a custom bucket. The 1.9 m3 (2.5 yd3) bucket features sloping sides – providing the operator good visibility to spot any curious cows that may poke their heads through the gate rails.